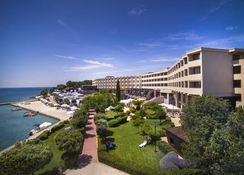 The 4-star Island Hotel Istra welcomes you the beautiful traffic-free St Andrew's Island located on the southern tip of the Istrian Peninsula, close to the city of Rovinj, Croatia, popular with couples and families for its wealth of holiday facilities. The modern Island Hotel Istra is set amid lovely gardens and has 326 smart rooms and 32 elegant suites to meet your occupancy needs. Adults and children can anticipate a fabulous holiday with so much to enjoy from a choice of dining and refreshment, pools, renowned spa and fitness features, sports activities, age-related clubs for younger guests, organised daily activities and evening entertainment and super beaches available around the island. 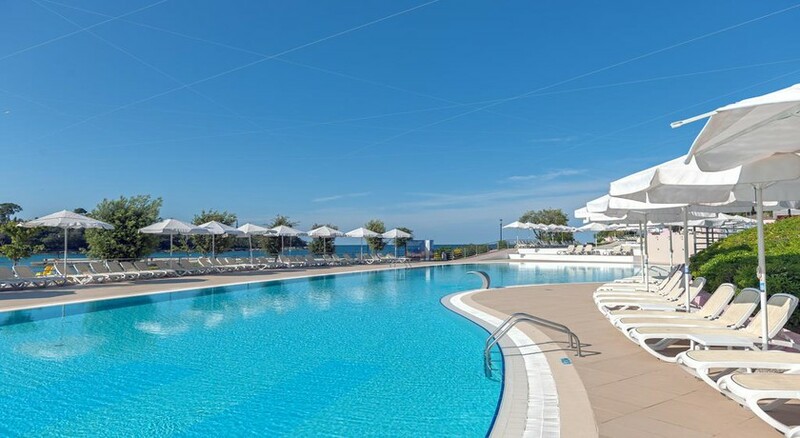 Indulge your partner and/or family and book into the super 4-star Island Hotel Istra on St Andrew's Island across from Rovinj city, Croatia; you may not want to leave. Getting to the hotel: 48km from Pula International Airport. Local tips: 20m from the sea and 40m from the beach. 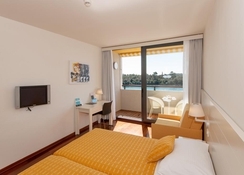 A 15-minute boat ride from Rovinj city for a variety of retail, dining and entertainment venues; taxi and bus terminal and 38km from the railway station. Food, drink and entertainment: A main restaurant serves a fresh breakfast hot & cold buffet each morning; choose your evening dinner from 3 themes: international & Mediterranean, seafood or gourmet Istrian dishes; the Lanterna Fish restaurant, set in an old restored castle, offers fresh seafood dishes; Pizzeria Birikin for pizza, meat & fish dishes; Lavender Grill for meat & fish dishes; Captains Club offers snacks, specialties, cocktails and soft drinks; and refreshment bars include a Fresh Corner, Pool bar, Blue bar and Aperitif bar, some of which also serve light meals, snacks and pastries. An animation team host an evening entertainment programme. Sport, games and activities: 2 outdoor swimming pools (freshwater and seawater), sun terraces with deckchairs and shade, garden areas; a choice of beach areas: gravel shore in front and wilder, secluded around the island, deck chair & parasol rental available; Otok Spa Wellness Arena (chargeable) includes an indoor freshwater swimming pool, Finnish saunas, Turkish baths, infrared sauna, Kneipp foot baths, indoor/outdoor whirlpools, massage showers with tropical rain, a range of face & body treatments & therapies, resting areas with heated & water beds, a fitness centre which includes a recreational heated freshwater pool and a personal trainer available, and a Mediterranean Garden with whirlpool baths, outdoor massage spaces and outdoor lounge area. Recreational sports include 3 tennis courts (lessons available), basketball, beach volleyball, Boccia, table games, archery, cycling & walking trails, running tracks, ski running simulators and more, all overseen by a professional animation team. For the kids: Open daily for 2 hours in the morning and in the afternoon, except Saturdays: Baby Club for ages 0-4; Mini Club for ages 5-8: a specially designed 14-day programme; Maxi club (ages 9-12): a specially designed 14-day programme; evening programmes for children (mini disco, mini cabaret, mini miss and mister pageant, cartoon evening, talent show). A children's pool adjacent to main pool, a large indoor play area and large outdoor playground. Cots are available on request (max. 1 per room). Guest accommodation has a fresh modern ambience, interiors of light tones, drapes and fabrics of soft pale hues, smart furnishings on smooth parquet flooring and amenities for your comfort and convenience; features include a private furnished balcony, central air-conditioning & heating, en suite heated bathroom with bathtub or shower, hair dryer, make-up mirror & toiletries, free WiFi internet, LCD satellite TV, telephone, desk with chair, mini fridge with refreshments, safe box, Queen-size bed and comfortable seating. There are adapted rooms available to guests with disabilities.